LUCRAM is a truly multi-disciplinary centre of excellence and spans over a broad field of research interests within risk analysis and management. The origins of LUCRAM can be traced back to the early 1990’s when plans to develop a Master’s programme in Risk Management and Safety Engineering were born. Since 2012, LUCRAM consists of representatives from each faculty at the university and led by a board of 12 members, appointed by the principal of the Faculty of Engineering. The main mission for LUCRAM is to serve as a dynamic, forward thinking resource for risk management research at Lund University. Since 2007 LUCRAM cooperates with the University of Copenhagen in running a Masters programme in Disaster Management. The programme is multi-diciplinary and administrated by Cluster for International Disaster Studies (CIDS) at Lund University and Department of International Health at University of Copenhagen. More information. LUCRAM has collaborated with Rollins School of Public Health in Bangladesh, which assists with a field based course in Risk Assessment Methods, that takes place in Bangladesh.The department is also looking into the possibilities of finding partners in other South Asian countries for research and innovation in Climate Change Adaptation in coastal and mountain areas. Johan Bergström to the right with Indian guest researcher Hilaria Soundari. From a visit by SASNET’s Lars Eklund on 24 November 2015. Associate Professor Johan Bergström, was the Director for the Centre for Societal Resilience, a university-wide independent transdisciplinary centre for research and innovation at Lund University, which closed down in the summer 2016. Its mission was to promote a resilient society by providing new knowledge, processes, methods and tools, and by supporting initiatives that apply them in practice. The centre aspired to become a world-renowned hub of knowledge and action, with the vision of understanding, explaining and improving our world and the human condition through research and innovation for safety, security and sustainability. It was established in 2013 as a development from its predecessor, Training Regions Research Centre, which was part of a triple-helix formation called Training Regions. The centre built in other words on the established infrastructure and activities of its predecessor, and drew on the full breadth and depth of research at Lund University, which is consistently ranked among the top hundred universities in the world. The centre also collaborated with other universities and research institutes, as well as with public organisations, private companies and civil society organisations. All contributing in different ways to the safety, security and sustainability of society. Associate Professor Per Becker has combined research with a career in humanitarian assistance and international development cooperation focused on disaster risk reduction, recovery and conflict management. The early part of his career, he worked in the private sector and in the fire and rescue services in Sweden. In 2000 he started to work for SRSA, which was a Swedish governmental humanitarian and development aid organisation that since 2008 is part of the Swedish Civil Contingencies Agency (MSB). After various positions within SRSA, Per was appointed Head of Capacity Development and Recovery Section, before joing Lund University in 2007. He has worked in many countries, including Pakistan and Sri Lanka, and he is interested in transdisciplinary research of sustainability and social change, of what makes society resilient to disturbances, disruptions and disasters, and of capacity development as an intentional tool for creating and maintaining such resilience. His research interests focus on the interactions between the physical environment, social organisation and social behaviour in relation to societal safety and sustainability. Especially on issues of risk and vulnerability, on what makes society resilient to disturbances, disruptions and disasters, and on capacity development as an intentional process for increasing such resilience. Personal web page. Per Becker is currently (Nov. 2015) working for UNICEF in Fiji. He will return to Lund University in April 2016. PhD candidate Roshni Pramanik arrived as a scholarship holder in September 2010. She came from Tata Institute of Social Sciences (TISS) in Mumbai, from where she has a Master’s degree in Disaster Management. She works on a project entitled ”Inter-Organizational Collaboration in Crisis Response Management – Exploring Conditions for Improving Collaborative Behaviour Across Organizational Borders”. It has some focus on the Indian tsunami disaster management in 2004. Read an abstract. Roshni will defend her Licentiate thesis on Thurday 26 November 2015, 10.15–12.00. Venue: E Hus, Room no. 1406, Ole Römers väg 3, Lund. 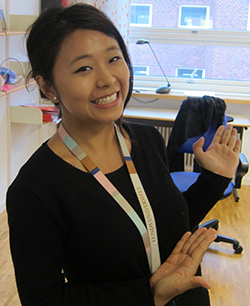 PhD candidate Phu Doma Lama has been working at the department since July 2014, and she is also associated to LUCRAM). Phu is working on a project about how the Sherpa community in Nepal has adapted to the ongoing Climate Change. She carried out her initial fieldwork in eastern Nepal in the spring 2015 – before the disastrous earthquake. She plans to go back to the same places in the spring 2016. 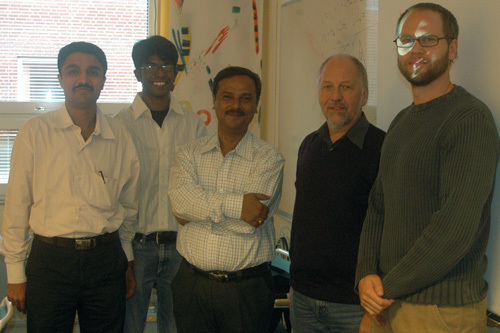 The three Indian Erasmus Mundus scholarship holders to LUCRAM in October 2009, Dr. Mudit Mankad, PhD candidate Emmanuel Raju, and Dr. Gupinath Bhandari, along with Kurt Petersen and Per Becker. Two senior Indian researchers and two PhD candidate came to LUCRAM in 2009 and 2010, as scholarship holders through the Erasmus Mundus External Cooperation Window mobility programme Lot 15/13, coordinated by Lund University, that was announced in 2008 and 2009 respectively. 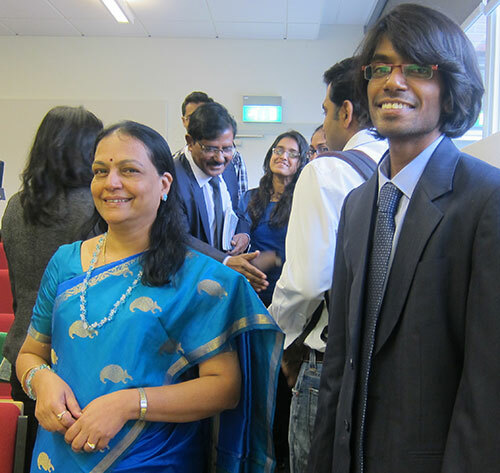 A total number of 53 Indian students, PhD candidates, post-docs and academic staff, were selected to come to Lund University in the first batch 2009, and 16 people came in the second batch of 2010. More information about the EMECW programmes focusing on India and South Asia. Dr. Gupinath Bhandari (photo), Sr. Lecturer and faculty member at the School of Oceanographic Studies, Jadavpur University, Kolkata, visited LUCRAM for a period of two months in 2009 as an academic staff with the objective to learn more about Disaster Management in general, and Risk Analysis tools and methodologies in particular. Dr. Bhandari was also keen to develop future collaboration in research work and course development in the common topic of interest and common emerging areas between Lund University and Jadavpur University. He has a PhD in Coastal Engineering, and his research interests are Coastal Erosion, Riverbank Erosion, Embankment Engineering, and Disaster Management. Dr. Mudit Mankad was the second senior researcher who received a scholarship under the Erasmus Mundus mobility Programme to visit LUCRAM for 2 months during 2009 as an academic staff. Since August 2006, Dr. Mankad works as a lecturer in the Geoinformatics Division at the Dept. of Geography, University of Pune. His research work focuses on needs and possibilities for using Geographic Information Systems (GIS) and Remote Sensing (RS) to support the analysis of risks and capacities for disaster risk reduction. This work will also try to highlight various GIS and RS tools and techniques which can help in disaster risk reduction at various levels including Community, Municipality, State etc. Emmanuel Raju was the third scholarship holder accepted as a PhD candidate to LUCRAM and the Dept. of Fire Safety Engineering and Systems Safety in 2009. He came from the Tata Institute of Social Sciences(TISS) in Mumbai, where he obtained an MA in Disaster Management. His main research areas are International Disaster Management, Disasters and Development, and Disaster Risk Reduction. Emmanuel defended his doctoral dissertation entitled ”Exploring Disaster Recovery. Coordination: Stakeholder Interfaces, Goals and Interdependencies” on Tuesday 17th December 2013. (Photo to the right, along with mother and father). Faculty opponent was Prof. David Alexander, University College London, UK. Venue: Lecture hall K:F, Kemicentrum, Getingevägen 60, Lund. Abstract: Disaster risk management has seen the importance of coordination at various levels of planning and implementation, ranging from preparedness to disaster response, and in planning for long term recovery and sustainable development. This thesis aims to develop a deeper and analytical understanding of stakeholder coordination for disaster recovery. The thesis is built on case studies from the mega–disaster of the Indian Ocean tsunami that affected India in 2004 and one case-study from repeated flooding in the Western Cape in South Africa. The key question addressed in this thesis is related to the factors affecting coordination for sustainable disaster recovery. The thesis presents the factors affecting coordination drawn from empirical data and its analysis. Finally, this thesis is an attempt to set the stage for more research to address recovery coordination as a governance issue. Mr. Raju participated in the first Nordic Conference on South Asian Studies for Young Scholars, organised by SASNET in August 2009. This conference gathered Masters students, Ph.D. candidates, and postdoctoral researchers, along with other junior scholars who are affiliated with universities in the Nordic countries (Denmark, Finland, Norway, and Sweden) who focus on South Asia in their work. More information on the conference. Emmanuel was also selected to represent Lund University at the Fifth European PhD workshop in South Asia Studies, held in Paris at the Centre d’Etudes de l’Inde et de l’Asie du Sud (CEIAS) from 22 to 24 September 2011. The workshop was co-organised by SASNET. More information. On 2 November 2015, the final Erasmus Mundus India programme (EMINTE) scholarship holder to Lund University from the 2013 lot arrived in Lund. More information about the programme. Dr. M. Hilaria Soundari, Assistant Professor at the Department of Applied Research, Gandhigram Rural Institute – Deemed University in Dindigul District, Tamil Nadu, India, will spend a month at the Centre for Resilience Studies. She belongs to the Congregation of the Sisters of the Cross of Chavanod. As a faculty member, she teaches research methodology and social work related papers in this University. She is specialized in the fields of development research, gender issues and social work. Having passed UGC-NET with JRF, she received Junior Research Fellowship (1999-2001) and Senior Research Fellowship (2001-2003) from UGC and carried out her doctoral research on ‘Empowerment of Rural Dalit Women: A Study of Self-Help Groups’. She also received Post Doctoral Fellowship (2012-2014) from University Grants Commission, New Delhi for her post doctoral research on ‘ICT initiatives for Rural Women Empowerment in India’. She has completed a UGC-Major Research Project on, ‘Achieving MDGs: Role of Marginalized Women and Micro-Credit’. She is also working with the marginalized women and children at the grass root level for 21 years in rural India and doing research on their empowerment and sustainable development. She has authored a number of articles in renowned journals and edited four books namely ‘Dalit Women: Dimensions of Empowerment’, ‘Emerging Dimensions in Self-Help Groups’, ‘Indian Agriculture and Information and Communication Technology (ICT)’, ‘Skill Development for Socio-economic Progress’ and ‘Higher Education and Gender Issues in Rural India’. She has visited United States of America, Netherlands, Switzerland, Hong Kong (China), Germany, United Kingdom, Sri Lanka and Italy. Her research is mainly in the field of Social Work, and she has written extensively on issues such as Alternative Approaches to Empower Dalit Women, and on Self-Help groups for Sustainable Rural Development. More information about her research.